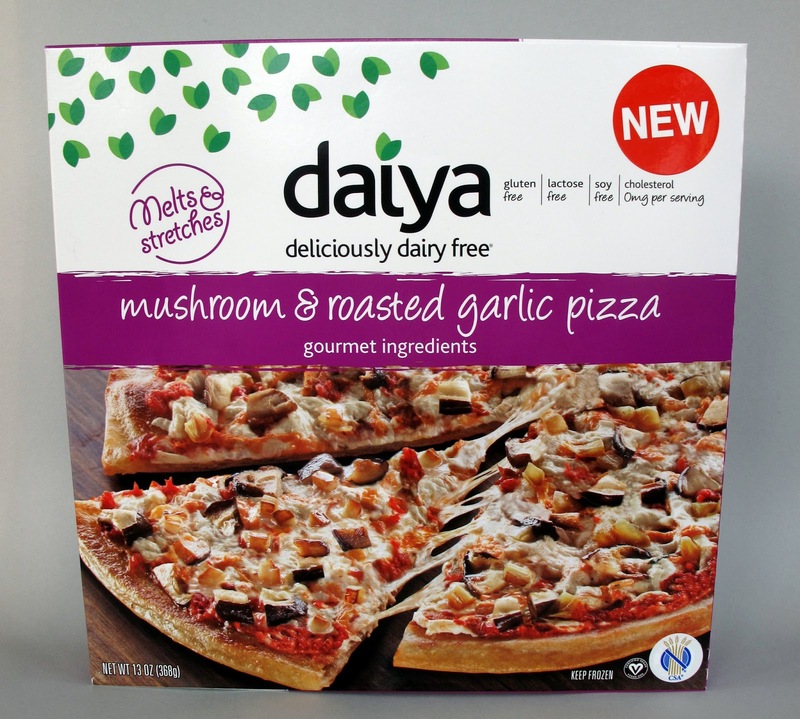 The newest entry into the Vegan frozen pizza world is from Daiya. Not content with conquering the Vegan cheese world, Daiya has four new pizzas that have been highly anticipated ever since they were announced. I chose to review the Mushroom & Roasted Garlic Pizza, but you can also get the Cheeze Lover's, Margherita and Fire-Roasted Vegetable. One of the main selling points of these pizzas is that they're gluten-free. While I'm not gluten-free, I think it's exciting Celiacs and wheat-sensitive people have four brand new pizzas to choose from. Right off the bat, I have to address the cost and size of the pizza. The pizza box gives the illusion that the pizza is bigger than it really is. In reality, the pizza is 12 oz, or the same as an Amy's Pizza. Also, the Daiya Pizza is a little bit pricier compared to Amy's or even Tofurky. In Daiya's defense, I'm sure the gluten-free crust is costlier (the Amy's gluten-free pizza tends to cost more) and therefore, they must charge more. But I think most people will probably complain about the $9.99 price. Ok, but how does it taste? Well, I was a little disappointed. I felt the flavor was a bit muted. I would have liked some more sauce or something to give it a little zing. Or possibly more toppings. Texture and style-wise, the pizza reminded me of a Tofurky Pizza. The crust is thin and the veggies are diced. You get two styles of Daiya cheese, with the right amount. As for the crust, I thought it was just ok. A little too thin for my taste. In the end, I'm glad there's another Vegan pizza choice out there, but the price is high and the flavor isn't as compelling as I would like. It's not in my upper echelon of favorite pizzas, but when it goes on sale I'd definitely like to try the other flavors. I loved this pizza! I thought the flavor was great, loved the crust, and I'm happy it had lots of cheese. Tofurky doesn't put enough cheese on their pizzas. I personally thought the crust sucked...I like thin crust but this one was just not right. Also the toppings were a little lackluster, very skimpy portions.